1.) To win, you need 7 panels of your color connected together. Does it need to be one continuous group, or do you win if you have 3 connected in one place and 4 connected in another? It must be one continuous group of 7. 2) Do they have to be a chain, so you can count a string of 7 without backtracking, or can there be branches? The seven panels all just have to be touching each other (contiguous). It's okay if it's a branching blob, rather than a single chain. As long as you can travel from one panel to all of the others through the same group, it counts as contiguous. 3.) 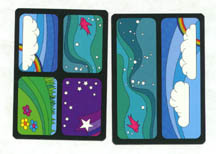 In your group of seven, do the panels have to be touching each other, or is it just a string of connected cards? The panels must be touching. In this example shown here,water has a chain length of 2, and air has nothing. 4.) Suppose on the very first turn of the game, the first player zaps the center card. What happens next? Do we replace it from the deck or does the next player get to play any card they want? Flip the next card as you would at the start of the game. 5.) Do you draw before you play, or after? If you draw after you play, Trade Hands hoses the person you trade hands with. No, you should draw a card before you play one. 6.) If another player creates a group of seven of my elements, do I win immediately or only at the start of my turn? 7.) If there are less than 5 players, can I trade goals with one of the unused goals, or must I trade with someone who is already playing? (How did this get left of out the rules? I thought sure it was in there!) Yes, when trading goals you can trade with an unused one. When shuffling goals, also be sure to also gather up any unused goals and shuffle them in.